American Water Spaniel Temperament (Friendly, Energetic): Can You Keep Up? The American Water Spaniel temperament makes him a lovable dog who’s also an excellent hunter. He is intelligent, protective, and easy to train – what more could you want from a dog? The American Water Spaniel is a very energetic dog. This is a good thing. Energetic dogs tend to be skinnier, so you don’t have to worry about giving him an occasional treat here and there. Energetic dogs also suffer less from conditions that affect the brain as they age, like Alzheimer’s. And speaking of older dogs, having an energetic disposition means that a dog will have fewer issues with sore joints as he ages. The phrase “move it or lose it” applies to dogs, too. When compared to other breeds, and with some work, the American Water Spaniel can be an incredibly obedient dog. Obedience is one of the traits you need and want most from a dog. It makes life with him less stressful and more enjoyable, and you will be less frustrated when you need him to listen to you about something important. The American Water Spaniel is an easygoing, happy dog who will quickly befriend you. The American Water Spaniel can have a stubborn streak, but this does not affect training him all that much. He wants to make you happy, and he enjoys a challenge, so training him is usually a breeze. In fact, even children can easily train him! That’s certainly not something you can say about every dog. The American Water Spaniel’s intelligence is pretty impressive. When it comes to learning something new or being able to do a particular task, he “gets it” pretty quickly. The American Water Spaniel can develop a close bond with members of its family and is very protective of them. This trait also helps this breed be a great watchdog. Here’s some interesting American Water Spaniel information: he is actually the state dog of Wisconsin! Breeders created the American Water Spaniel in response to hunters’ need for a dog that could hunt on land and in the water. They also needed a dog that was small enough to fit into a smaller boat and tough enough to withstand colder temperatures. And so, the American Water Spaniel was born. Many compare the American Water Spaniel to the Boykin Spaniel. When considering the American Water Spaniel vs. Boykin Spaniel, the two are similar in size and weight. They both also have about the same tolerance for cold, which makes them great hunting dogs for colder climates. Experts recommend early socialization for all breeds, and this is especially true for the American Water Spaniel. If not socialized early enough or often enough, the American Water Spaniel can become aloof with strangers or aggressive toward other dogs. They can also be stubborn. However, they do have a genuine desire to please their masters, which can turn what would have been an otherwise frustrating training session into a fun one. This is not a breed that responds well to harsh training methods, so no yelling or scolding here. Focus on positive reinforcement for better results. The American Water Spaniel is a vocal dog, and he will use his barks, whines, and howls to get what he wants – unless you teach him otherwise. This is especially true if you spend too much time away from him. This is a breed that is prone to separation anxiety, and if he’s feeling anxious he won’t think twice about letting you know it. 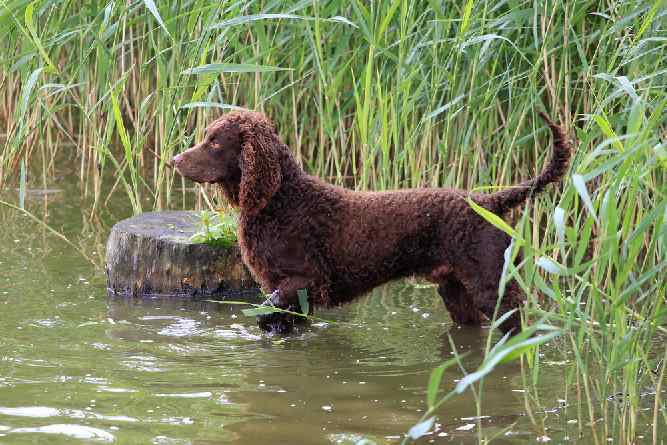 If you are up for the fun and challenge of training your American Water Spaniel then check out these FREE Dog Training RESOURCES. For the American Water Spaniel, shedding is typically easy to control with weekly grooming with one of those pin brushes. During shedding season, you will, of course, need to brush him more often. If you’re wondering, is the American Water Spaniel hypoallergenic? The answer is no. While some consider certain breeds to be better for allergy sufferers, no dog is entirely hypoallergenic. If you think you may be allergic to the American Water Spaniel, spend some time with the dog you’re interested in before you commit. This will help you to know for sure whether you are allergic or not. American Water Spaniels need about one to two hours every day of walking, running, or playing games, like fetch. They also love the outdoors. One of the ways you can bring some outdoor enjoyment to the American Water Spaniel is duck hunting. This helps him get his energy out while also doing what he loves best and what’s in his blood: the hunt. Another perk is that this dog learns best when you give him a specific job to do. So if you bring him hunting, he could not be more in his element. The bottom line is to exercise the American Water Spaniel each day. Else, he will channel that extra energy into more destructive behavior. Most American Water Spaniels are healthy. Their life expectancy is between 13 and 15 years. Note: Don't let the many issues above scare you. The best way to approach health problems is to prevent them in the first place. The Ultimate Guide to Dog Health is a great place to start. Get a copy to keep at home. It will help you prevent the painful health issues that can plague your lovely American Water Spaniel and rob him from expressing his winning personality and maximizing his life expectancy. Knowing all that you know now, would you like to add an American Water Spaniel puppy to your family? Yes? That’s great! You can find an American Water Spaniel for sale either from a breeder or through a rescue or adoption agency. The average American Water Spaniel price is around $800. The price of an American Water Spaniel for sale depends on where you buy the dog and from whom. Some American Water Spaniel dogs can cost as much as $1,000, depending on the breeder and bloodline. If you want to adopt an American Water Spaniel puppy, they may be available through your local rescue organization or adoption center. If you’re looking to save money, then adoption or rescue is the way to go. This is because an American Water Spaniel that is up for adoption is significantly less money than a dog bought from a breeder. An adoption is ideal if you want to skip the puppy stage, or if you would like to adopt a mixed breed, rather than purchase a purebred. With American Water Spaniel breeders, as with any breeder, you must be careful who you choose to buy a dog from. A good resource to consult is the American Water Spaniel Club. Here, the website provides a breeder directory, which you can peruse to determine which breeder you would like to contact. Once you pick a breeder, be sure to research the breeder thoroughly. Make sure s/he has had the dog you’re interested in checked for all the health conditions he may be vulnerable to. Conclusion: Why the American Water Spaniel? Insofar as American Water Spaniel facts go, this is a dog that has a relatively long lifespan, despite being prone to several health conditions. He loves his family, is great with children, and makes a fantastic watchdog. However, be sure to train him well when he is young. Socialize him often to avoid potentially aggressive or aloof behavior and teach him the appropriate times and places to use his voice. This is a dog that loves to exercise and that loves to be outside. Give him a hearty combination of both, and he will be one satisfied pup. He’s also a great hunter (it’s in his blood), and he learns best when you give him a challenge to overcome. Next post: How To Make The Most Of The Skye Terrier Temperament (Intelligent, Fearless, Friendly)?